Just an update on helping to send the Steelers Fans to Hawaii – there is still time to vote for Jack D. from Pittsburgh – currently he is behind some Jets fans to win a trip to the Pro Bowl in Hawaii. 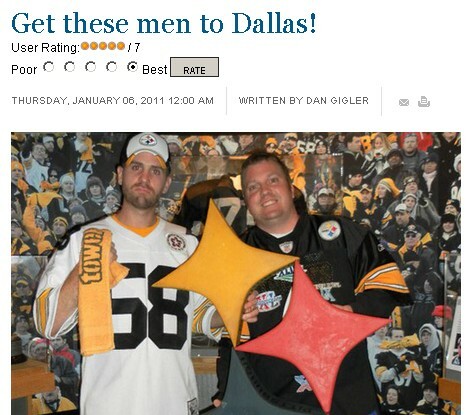 Dan Gigler who writes Blog’n’Gold for the Post-Gazette – just wrote about another Pittsburgh family who is competing to win a trip to the super bowl. They are in the lead but need your vote. Dan also included a link to our post about voting for Jack D. to win a trip to Hawaii. Thank Dan! And make sure to check out the PG’s Steeler Nation page on Facebook here. Come on Steeler Nation – just a few clicks to help out some fellow football lovers.